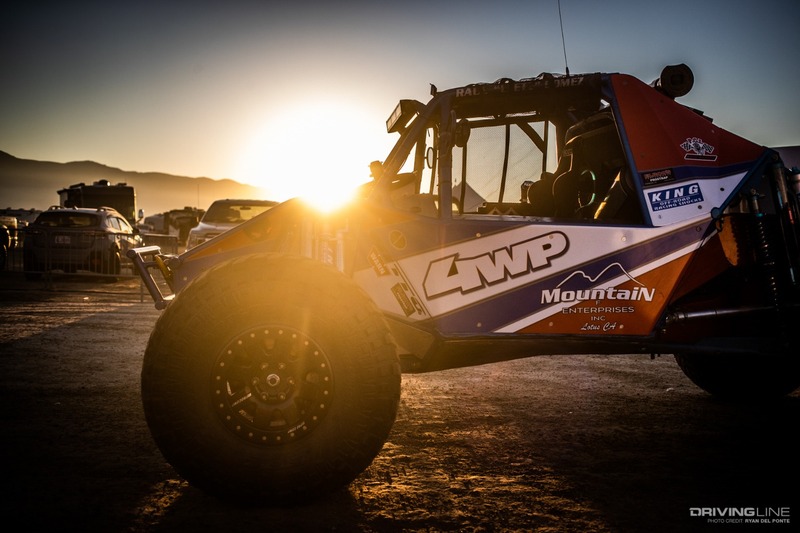 The morning of the 4400 race at the Nitto King of the Hammers powered by Optima Batteries was cold, as was the entire week prior. Frost had settled on the tents and campers around Hammertown, but the drivers and their cars were ready for a long day of battling for the crown. 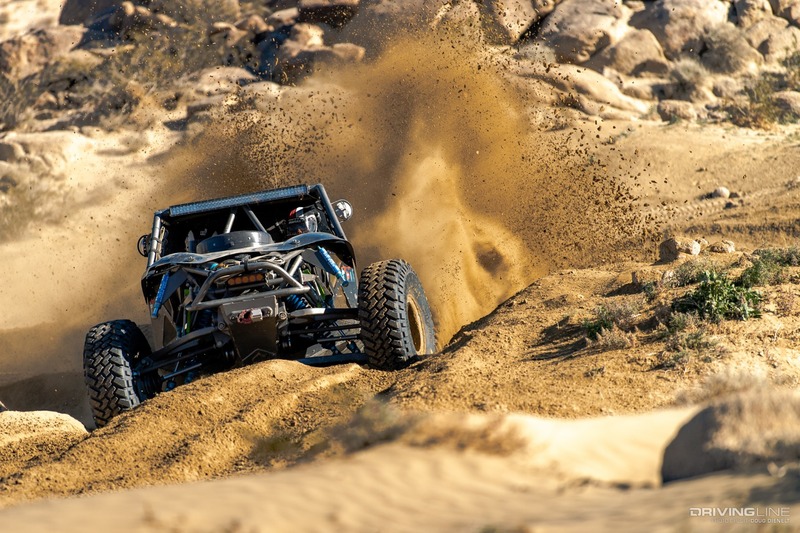 Considering that this year had the largest prize pool in King of the Hammers history, the stakes were larger than ever. Follow along as we take you through the minute-to-minute action for how the day unfolded. From Backdoor strategy to rollovers and battles for the lead, it certainly was an exciting day of racing. The cars drive over to the start line, ready to begin. Nick Nelson and Jason Scherer take off, with Nelson pulling in front out of the first turn. Erik Miller and Marcos Gomez start a little farther back in the pack. 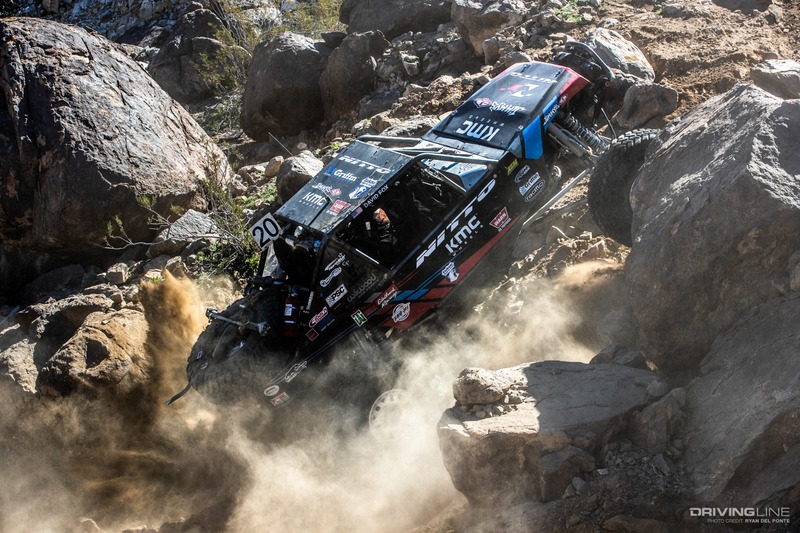 With only two solid-axle drivers qualified in the top 20, can Miller become a 3-time king? Vaughn Gittin Jr. takes off, now racing in 4400 after being so successful in 4500. His goal for the day is to just finish, but scores of drivers show how hard that is every year. The early leaders are Nelson, Scherer and Healy, with Shannon Campbell picking up ground. Casey Currie and Cody Addington both have early issues. Aaron Kaufman leaves the line for his second Hammers in a new car. It looks like he's gotten bit by the Hammers bug, too. 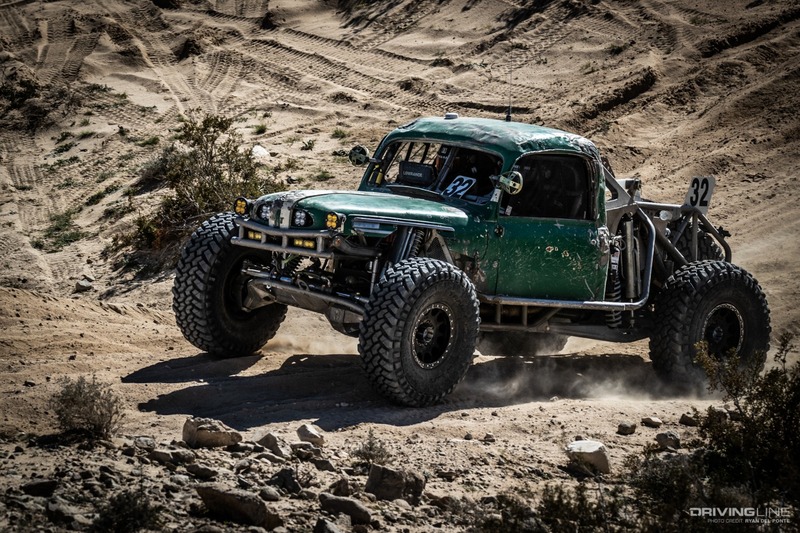 A few cars father back in the pack go up backdoor, but most opt for the desert loop first. Every driver has to go up Backdoor once during the race, but they can choose which lap to do it on. Will the leaders choose to conquer backdoor on lap 2 or 3? We’ll find out. 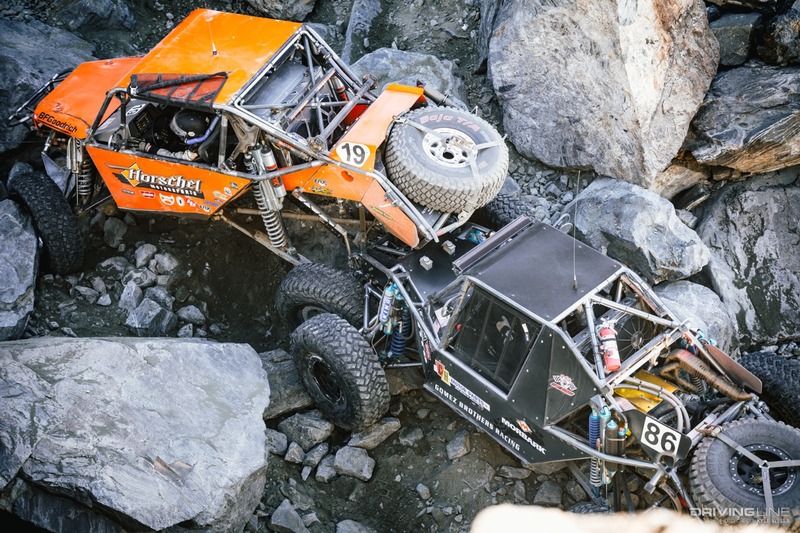 Quintin Hilburn gets helped by Dan Roderick by being winched up Backdoor when his winch failed. It’s great to see this kind of sportsmanship. Nelson and Scherer are neck-in-neck, with JP Gomez up to third. Remember, JP Gomez is coming off back-to-back victories. He's in perftect position to make it three in a row. Paul Horschel is making moves in the desert. He was so good there last year, but can he conquer the rocks? Scherer passes Nelson as they make their way through Cougar Buttes, but Healy is on top of both of them, leading on corrected time. 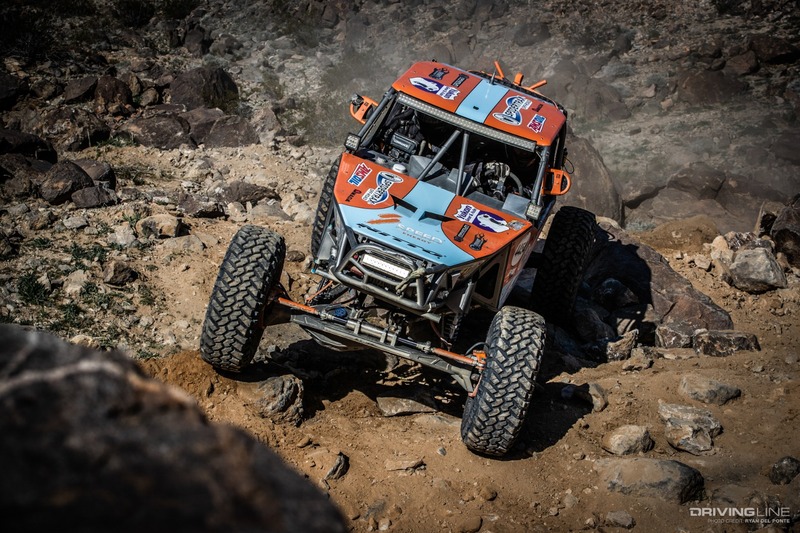 Nick Nelson passes Scherer back going back into the desert! Vaughn Gittin Jr. passes Bailey Cole, with Shannon right behind. It's still early, but things are going even better for Vaughn than he had hoped. 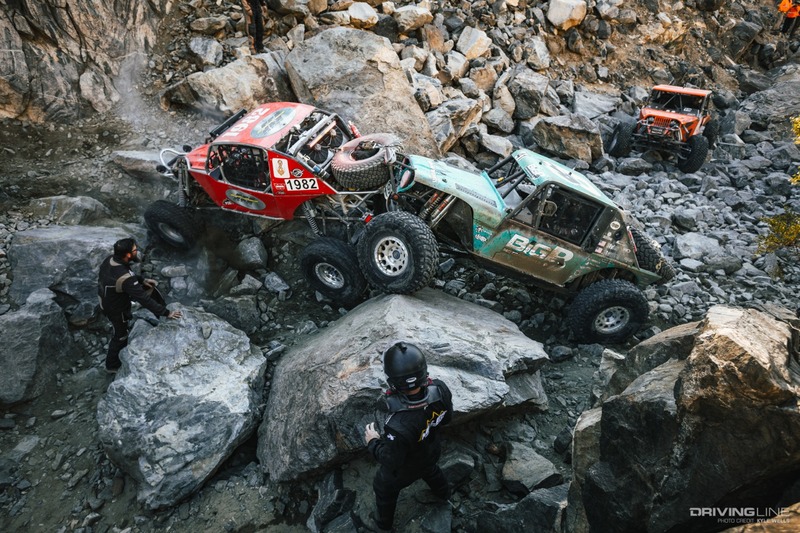 Nelson and Scherer go through Remote Pit 1 without stopping, but where is Healy? Healy’s car is confirmed to be broken outside Cougar Buttes. Horschel has taken his spot in the top three as the leaders head into Hammertown. Nick Nelson is the first across the line and pits to get some fuel. The car looks great, and it roars away after the stop. After being the second through Hammertown, Scherer joins Nelson at Backdoor. Horschel crosses the line third. 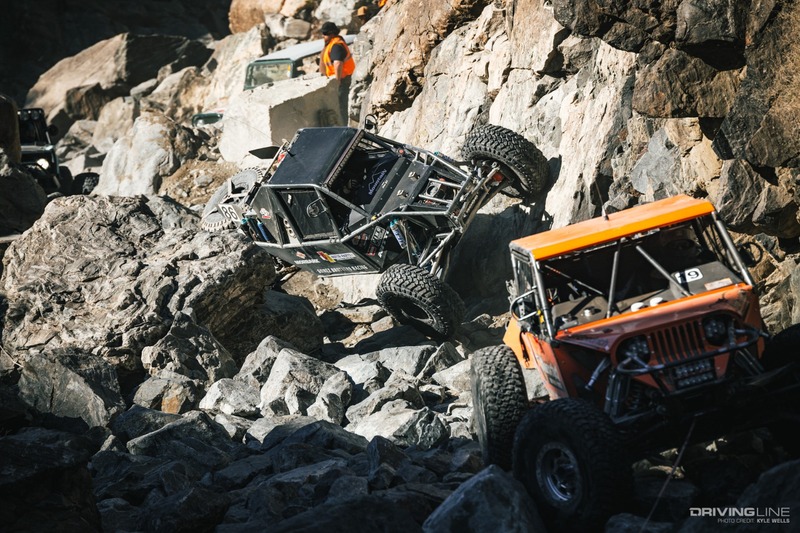 Both co-drivers get out to set up a winch, and it’s a running race to get the winch set first! Scherer gets winched up first and passes Nelson for the lead. Nelson gets up and now they’re together getting their winches back in. JP Gomez comes through fourth and does not pit. He's still in a great position for his third victory in a row. 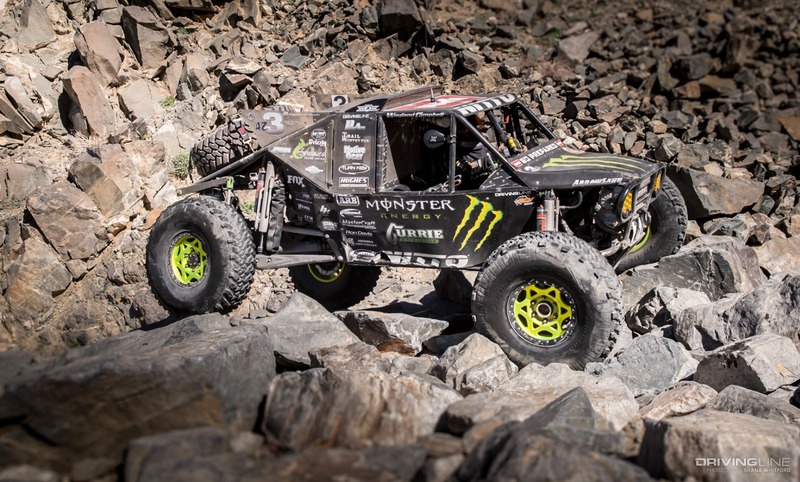 Erik Miller is the first solid-axle rig through Hammertown, gets some fuel and heads back out. It has been almost all-IFS this year, but you can never count out Miller. Nick Nelson has fallen back, while Scherer has caught back up to JP Gomez and Paul Horschel, both of whom skipped Backdoor. Nick Nelson and Levi Shirley choose opposite lines through Full of Hate, with Nick going with the harder, shorter route. Scherer is the first to go through Chocolate Thunder. He’s passed Horschel and JP Gomez. While it's close on the track, since Scherer has already gone through Backdoor, unlike either Gomez or Horschel, he is an excellent position. Nick Nelson comes out ahead of Levi Shirley, showing that his line was the better choice. 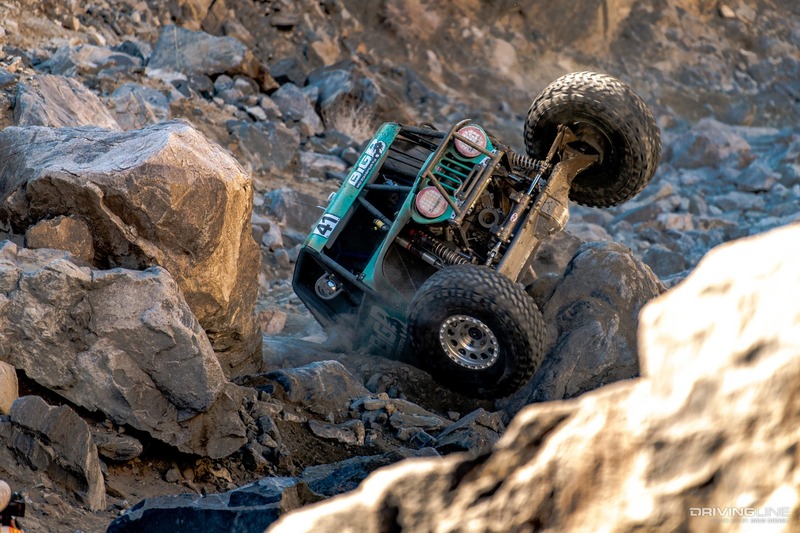 Erik Miller is making short work of the first rock section, showing why he loves the solid-axle setup. Like we said, you can never count him out, no matter how many IFS cars he has to battle. Nick Nelson and is stopped on course. He has had fueling issues in the past, and could they have returned at the worst time? Now with Nelson having fallen off the pace, Scherer's position as frontrunner has become even stronger. He is the only leader to have already gone through Backdoor. Even though there are only a few cars, there is quite a bit of traffic in Backdoor. It could get really congested on lap 3. This might play straight into Scherer's hands. 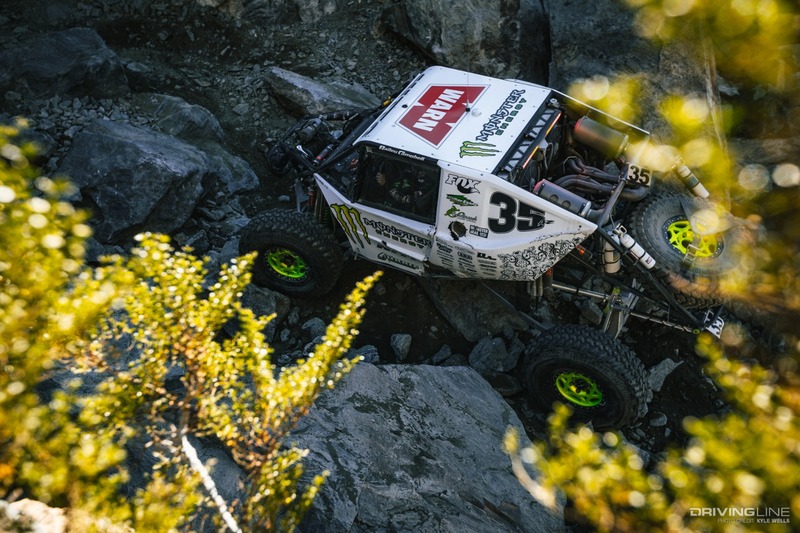 Levi is making moves and heading up Jack North with Vaughn Gittin Jr. right ahead of him. Bailey Campbell is back out on track after a long pitstop for repairs. JP Gomez has lost a wheel, ending his day. It's a really tough break, and this takes another leader out of contention. Loren Healy comes back into the pit, officially out. 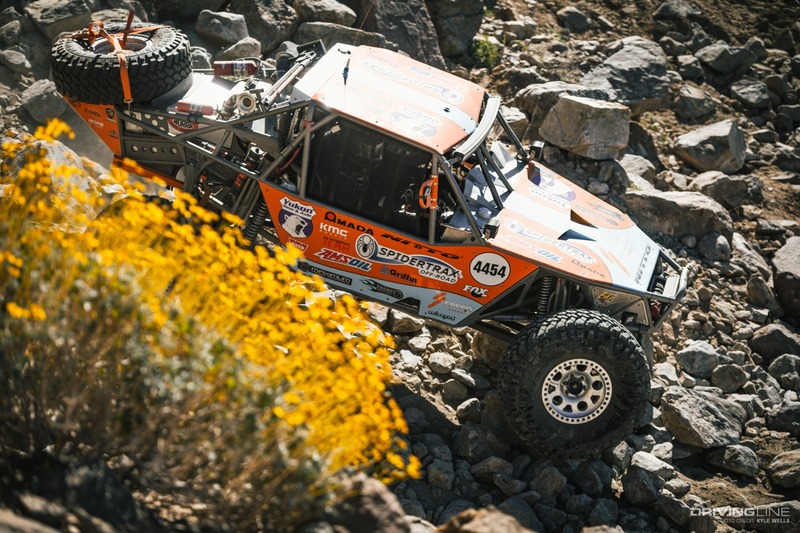 Wayland Campbell is into Remote Pit 2B, physically in third position. 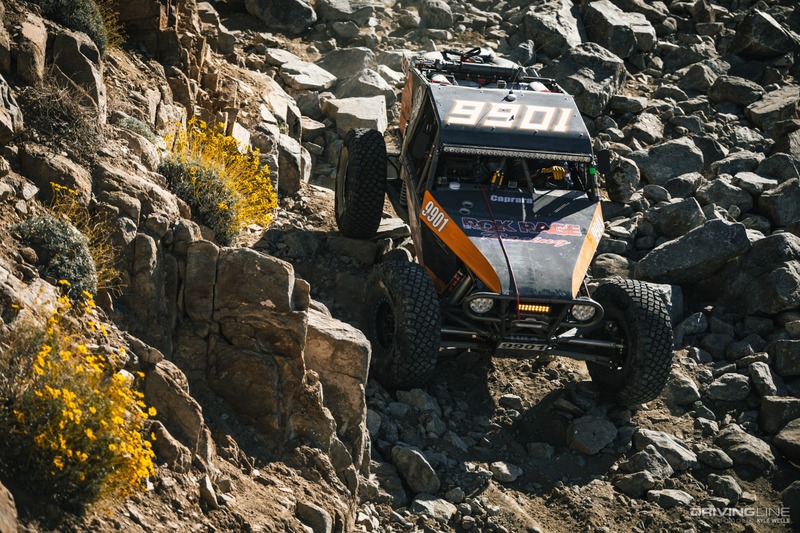 Bailey Campbell is picking up spots through the rocks. Whatever they did to repair her rig seems to be working perfectly. Scherer comes in for his final lap and does not stop. He looks to start cruising across the desert, not having to go up Backdoor like everyone behind him. Horschel comes into the pit in physical second, flying through as well. However, he will need to conquer backdoor before setting his sights on victory. Wayland gets to Backdoor, but he’s stuck behind Horschel. Horschel is up and Wayland gets out to winch. Now Horschel flips! He’s on his back. Erik Miller arrives at Hammertown physically in fourth, has a quick pitstop and heads to Backdoor. 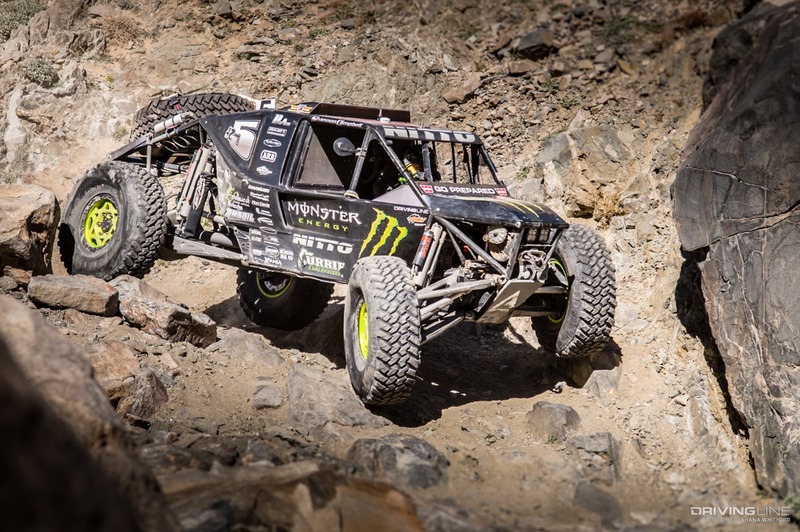 Shannon Campbell and Vaughn Gittin Jr. are a ways back for fifth and sixth. Miller shows up to Backdoor, but Wayland is still being held up by the flipped Horschel. They will all have to be careful. One wrong move by any of them could end very badly. Wayland makes the pass for second! Could this finally be the year that Wayland breaks through? He has quite a bit of ground to make up, but if anyone can do it, it's a Campbell. Miller passes Horschel for third, who is still trying to get righted. 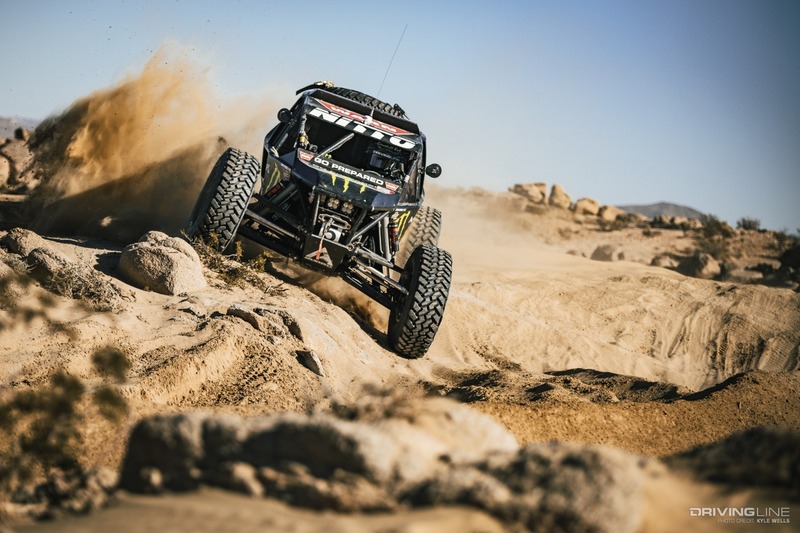 Shannon Campbell and Gittin Jr. come into Hammertown in fifth and sixth. Raul and JP Gomez, both out of the race, are in Backdoor helping Shannon winch! Competitors can help other competitors, so it’s perfectly legal and saved him a ton of time. The Gomez brothers are still at Backdoor, now helping their brother Marcos winch. it's so cool to see the brothers helping each other. Talk about brotherly love. Scherer is trying to make his way through lapped traffic on Jackhammer. With only a few tight lines through the rocks, even a couple of stopped or slow cars can add minutes to an otherwise quick lap. Wayland is maintaining an edge over Miller, and still looking to be about 10 minutes behind Scherer. We’re seeing more traffic on Backdoor. Racers have to choose whether to wait or pick alternate lines. Bailey Campbell finishes her second lap, but she goes back into the pit to repair her winch, her second major repair of the day. Shannon has caught up to Horschel in Sledgehammer, but Horschel has gotten himself totally stuck in the race line. Shannon’s patience will be tested. Horschel moves out of the way, indicating that there may be something wrong with his rig. Bailey Campbell is also back out on the track for the final lap after fixing her winch. There’s quite a bit of traffic on HWY 21, but Scherer appears to have made his way through already. What could have been a hindrance to him may end up being a big help. Gittin Jr. makes his way through Sledgehammer, nearing the sixth place and stopped Paul Horschel. Scherer heads for Outer Limits and Spooner’s, the last big test of the day. Horschel is underneath his car trying to fix it while it’s still in Sledgehammer. As Scherer makes his way through Outer Limits, Miller is only minutes away. Is he cutting down the lead? Time is running out for Miller to make a move. Wayland is stopped on course, paving the way for Shannon to overtake him for third. Scherer is entering Spooner’s, the last difficult rock section before the end. 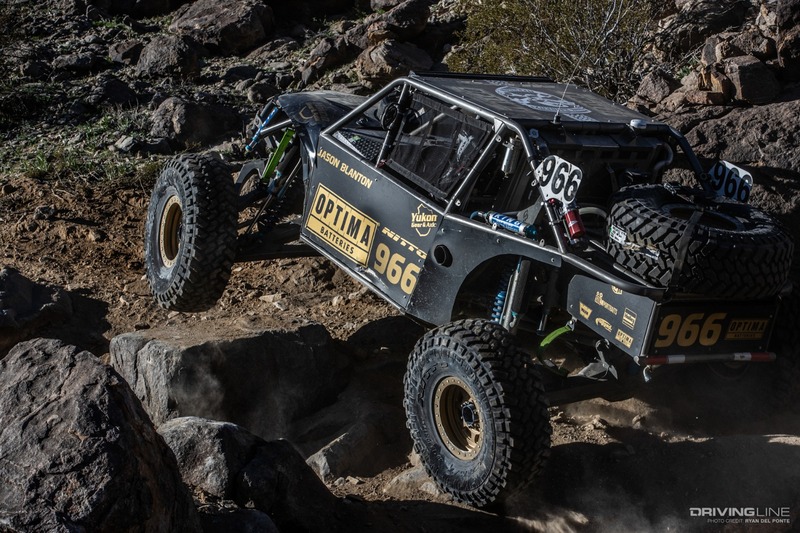 Since he had to winch on Outer Limits, will Miller be able to go without winching and make up some time? 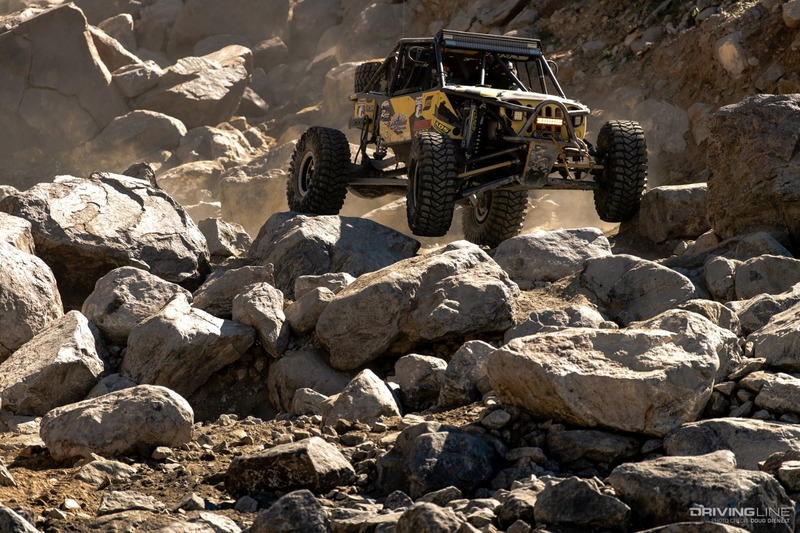 Erik runs straight through the section where Scherer need to winch, reeling him in to eight minutes on corrected time. 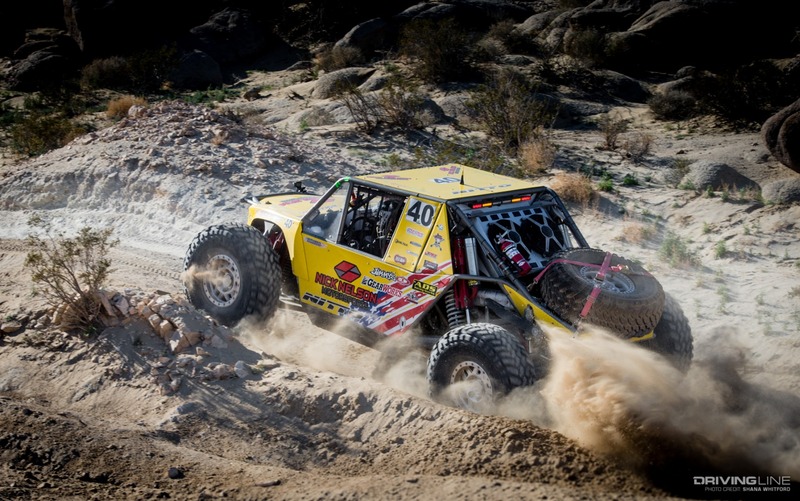 Scherer is back on the desert and headed for Hammertown. 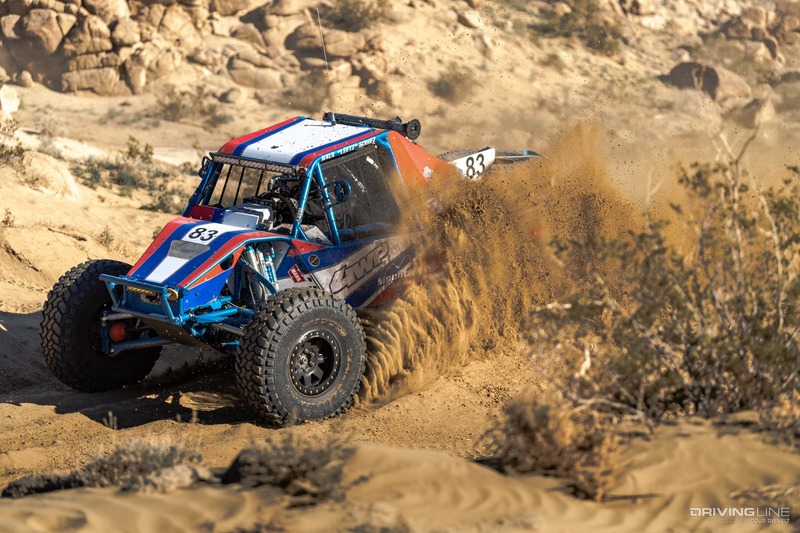 Shannon is going through Outer Limits, aiming for another podium finish, but Marcos Gomez is fast approaching, aiming for a podium spot of his own. Marcos Gomez has caught up to Shannon Campbell and the two are battling in Outer Limits. 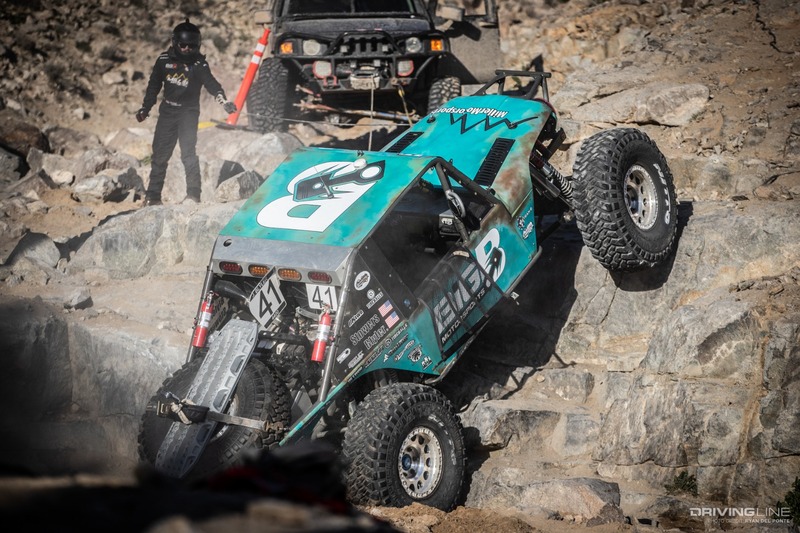 Gittin Jr. has had a problem and is stopped in the remote pit, losing fifth place to Tom Wayes. 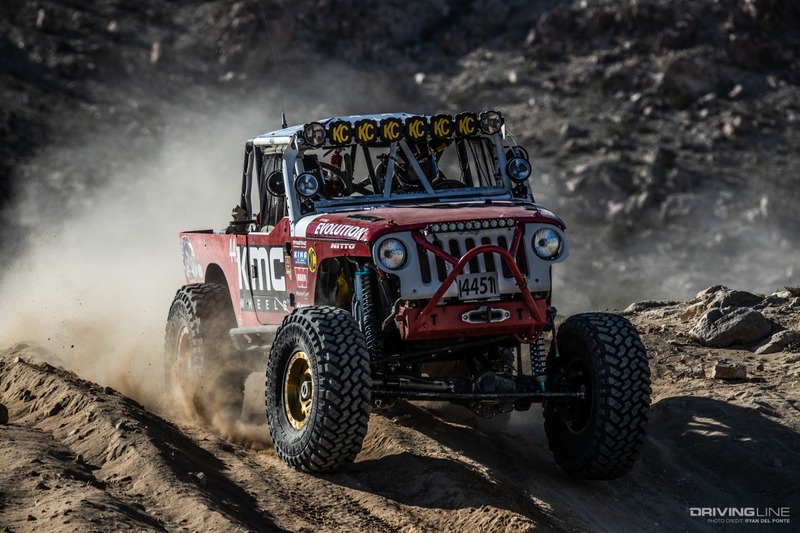 Jason Scherer crosses the line and is declared the back-to-back winner of King of the Hammers. Erik Miller finishes second, about six minutes behind on elapsed time. Paul Horschel is back running again after fixing his rig on Sledgehammer. Credit to him for sticking with his rig and never giving up. Shannon Campbell finishes in third place. Marcos Gomez comes across the line in fourth place. 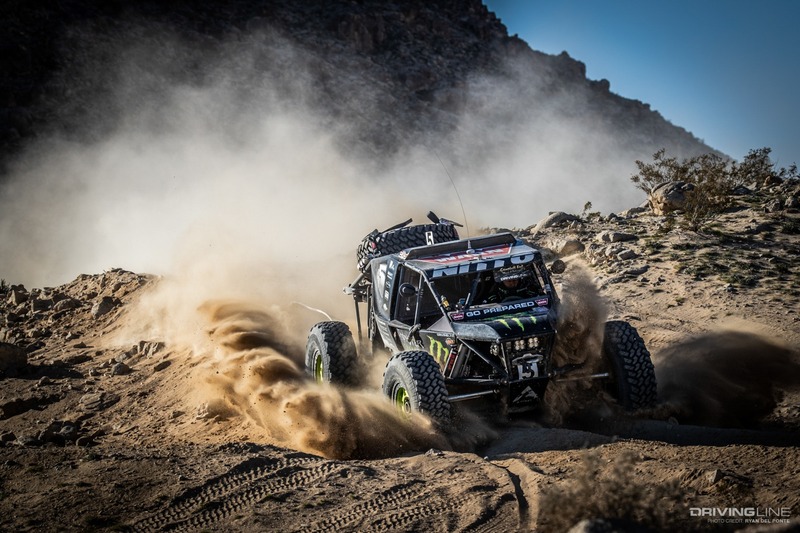 Vaughn Gittin Jr. is finally out of the rocks and driving through the desert back to Hammertown, sitting in seventh place. Tom Wayes finishes in fifth. Jason Shipman crosses the line sixth. Bailey Campbell finishes eighth as the sunlight fades, after battling so many issues throughout the race. “Every time we stopped, we made up that time in the desert or the rocks. Me and Terry just click really well,” she said. Dan Fresh finishes ninth in his first 4400 race. Josh Blyler is the tenth driver to cross the line, but ends up 11th on corrected time, just as the last light leaves the mountains. Michael Heston crosses the line 12th. Wayland is officially finished for the day, having never repaired his rig. After righting and fixing his rig, Paul Horschel finally finishes 14th. Bryan Crofts crosses the line 16th, but ends up finishing 17th on corrected time. Brent Goegebuer finishes 19th. Mitchell Thorpe is the 20th person to cross the line a few seconds later, but ends up 21st. Sam Collins rounds out the top 20. George Pronesti crosses the line 22nd, but ends up 23rd overall. Dustin Isenhour finishes 29th, with five minutes to spare. 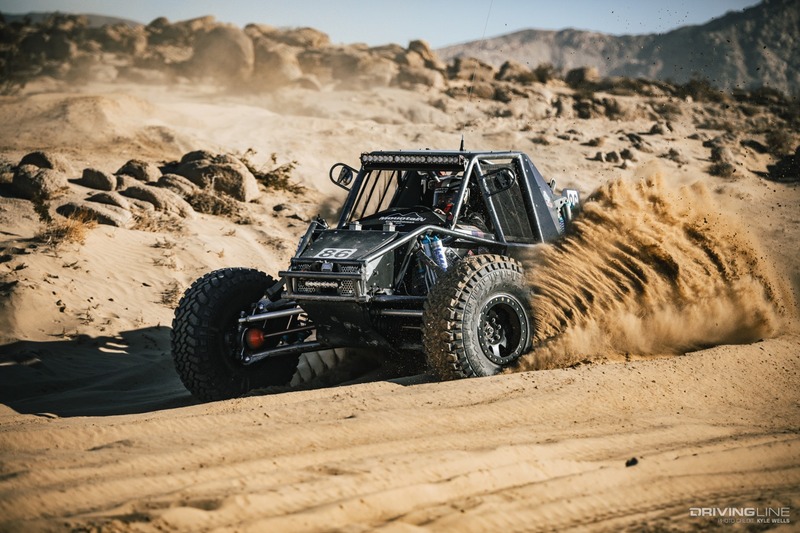 That concluded the 2019 Nitto King of the Hammers. Read below to see the full results and official times. it was another great day or racing and congrats to all our KOH finishers! We can't wait until next year. 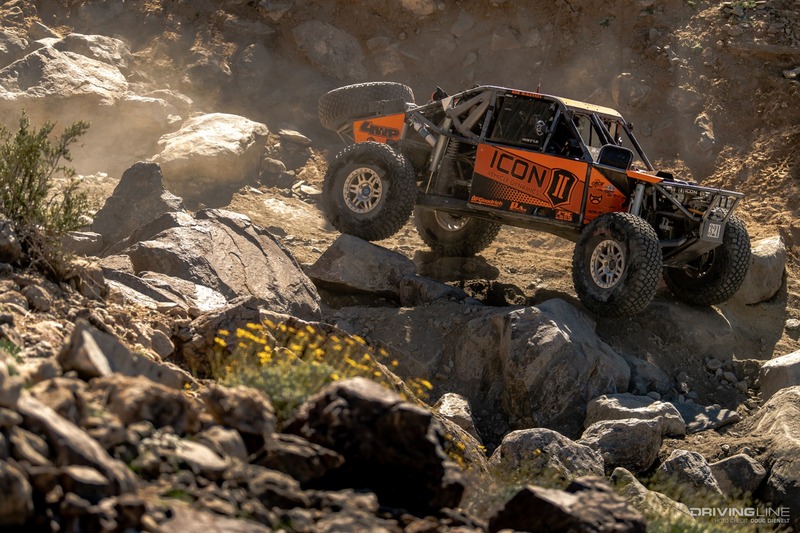 Did you hear that T1 Desert Trucks came to KOH this year?